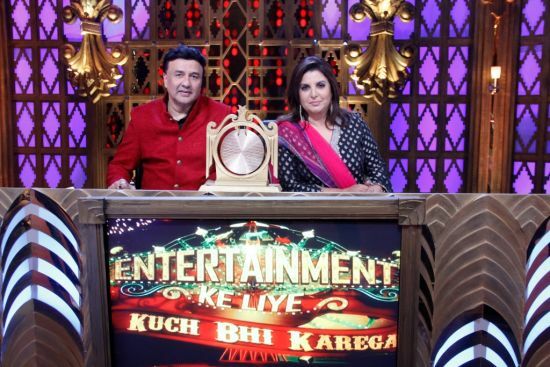 Opening Episode Of Entertainment Ke Liye Kuch Bhi Karega On Sony Entertainment Television, Monday 12th May 2014 at 9.00 P.M. The hit reality talent show Entertainment Ke Liye Kuch Bhi Karega 2014 is all set to return once again with five times more pagalpanti! And the curtains will be raised with our most beloved judges Anu Malik and Farah Khan along with hosts Mona Singh and Krushna Abhishek. Not only this, the opening episode will be an impressive affair with Krushna’s dhamakedaar dance entry on the song ‘Tune Maari Entry’ and ‘Gori Gori’. So get ready on Monday, May 12 to get some extra dose of pagalpanti at 9 pm only on Sony Entertainment Television.